Line a muffin tin with cupcake liners. Melt bag of chocolate chips + 2 tablespoons of coconut oil. 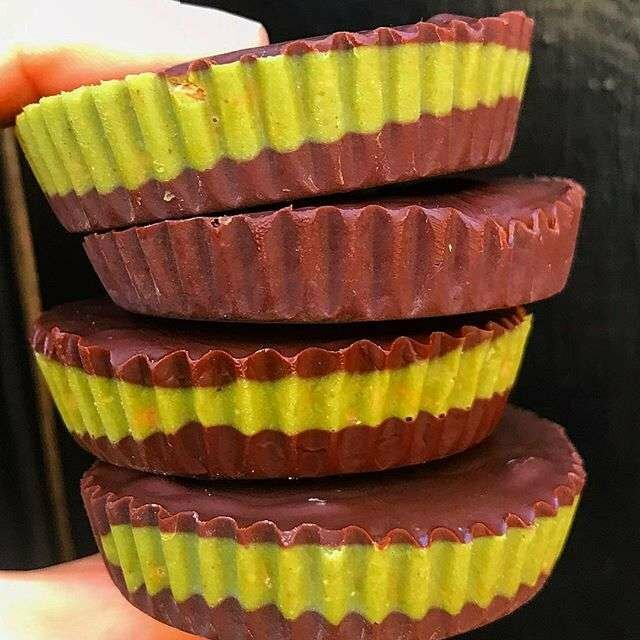 Fill the bottom of each muffin cup with the chocolate and let freeze while you make the matcha filling. Mix matcha, powdered sugar, coconut oil and Julie’s Real Cashew Butter and melt in the microwave. Pour a layer on top of the chocolate. Freeze again briefly to allow the matcha layer to become firm, then top with another dark chocolate layer. Freeze until firm. Allow them to sit out at room temp before enjoying!